Whether it is confessing your love to someone, sending condolences, showing gratitude or welcoming a new person, flowers say it beautifully; and for this reason they have been an indispensable part of American gifting culture. The Rose is possibly the most famous flower in the world & is the most popular flower for gifting. In 1986 President Reagan designated the Rose as the official flower and floral emblem of the United States of America. So if you are planning to send flowers to anyone in The United States, read our United States flower gifting guide. Please ‘like & share’ if you find our guide helpful. A Yellow Rose symbolizes joy & friendship. Want to send a joyful message; Yellow Roses are your best choice. A Red Rose symbolizes passion and romance. Send a dozen to say “I love you”. The Pink Rose symbolizes innocence. The Blue Rose (very rare) is a symbol of the unattainable. Send Orange Roses to show you desire & passion. A bunch of Red & White Roses signifies unity & a bond to stay together. Gift Peach colored Roses to show your appreciation. 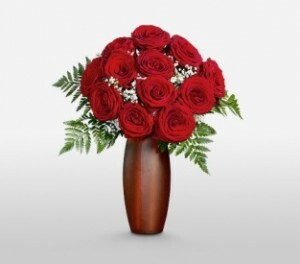 Send Cream Roses to show your charm and thoughtfulness. A lavender Rose symbolizes ‘Love at First Sight’. The biggest floral gifting day of the year is 14th February Valentine’s Day. It is rightly said that ‘Flowers and romance go together like coffee and conversations’. What could be a better time to proffer your beloved with a beautiful flower bouquet that expresses your love and undying admiration for her? The flowers of choice for this day are of course Red Roses. But if you’d like to be different, combine Roses with Red Chrysanthemums, as these too are traditional flowers to express love & affection. Of course, Roses are just the tip of the gifting iceberg. Chocolates, Teddy Bears, Gift Hampers, Perfumes & Cakes make great Valentine’s Day Gifts, the kind that they will never forget. Avoid waiting till the last minute to make your purchase; as demand (especially) for Red Roses is massive during Valentine’s Day. Shop smart, place your order online or with a florist well in advance to get an affordable price & most importantly assured availability. There’s an old proverb that says, “A mother carries a child in her womb for 9 months and in her heart for a lifetime.” While celebrating this amazing person just once a year is hardly doing her any justice; each year 2nd Sunday of May is dedicated to her as Mother’s Day. This day is a celebration honoring motherhood. Gifting Mother’s Day Flowers will really make her day special. Remember to select the flowers that she loves. Send a bouquet or an arrangement of assorted colorful flowers, with a personalized card and a warm hug. Flowers will show your mom how much you appreciate all that she does. Christmas is celebrated on the 25th December, is the largest holiday across the US. People usually take the whole week off till New Year to visit family. It’s the season of joy &celebrations. With red and green colors all around, the same is replicated in flowers as well. Most homes often have more visitors during Christmas and the host usually serves a delicious feast. Hosting a Christmas Party is incomplete without a Christmas floral centerpiece; thus it’s a good idea to gift a Christmas centerpiece arrangement that can be displayed on their dining table. Deciding on a centerpiece can be a bit daunting. We suggest going with a centerpiece arrangement made of Red Roses or Carnations, Red or White Lilies, Red Hypericum Berries, Holly, Ivy, Mistletoe, Poinsettia, and Gypsophila. Don’t miss on Decorative Ornaments and Candles to add a bit of flair to your Centerpiece. Thanksgiving Day traditionally kicks off the holiday season in the United States. It falls on every fourth Thursday of November to celebrate the first harvest of the season. Thanksgiving is traditionally celebrated with a family dinner and arrangements Autumn Flowers, such as Anemone, Baby’s Breath, Carnations, Chrysanthemums, Freesia and Gerberas. Most florists and online services will offer a selection of Thanksgiving’s Special Arrangements and that can be an easy way to select something right. When it’s someone’s birthday they are bound to get many gifts, but getting a bouquet or arrangement of classic flowers from you can be a personal experience and an unexpected surprise. You can theme the arrangement depending on your relationship with the recipient, such as red flowers for your wife, brightly colored flowers for friends or mixed seasonal flowers for mom or dad. 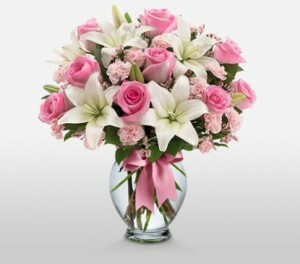 A birthday bouquet works well, however, make sure the recipient has a nice vase at home to place their flowers in. If not, we suggest selecting a flower arrangement with a vase and a happy birthday balloon. Price : Typically a Mixed Flowers Arrangement will cost between $50 to $80, depending on the size, the number of flowers and the types used. An arrangement of One Dozen Roses will cost from $60 to $70 to deliver. Prices will be higher if you are looking for exotic flowers like Anthuriums, Orchids, Birds of Paradise, Ecuadorian Roses, Tulips, Calla or Oriental lily. Instead of just writing “Happy Birthday” on the card message, go for a different and creative message. 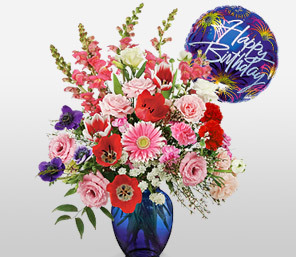 Consider the likes and dislikes of the recipient before selecting a birthday arrangement. Place your order well in advance so as not to miss this important occasion. A wedding is a beautiful ceremony which binds two people in a loving bond. When selecting flowers to send for a wedding, its best to go for something bright and grand.Don’t forget to add a warm message like “Your life just got better, hope you enjoy it to the fullest”. Even if you are giving a wedding gift, it’s customary to accompany it with flowers. 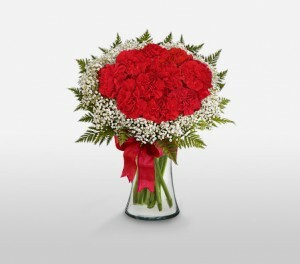 Price: You can easily get white and peach roses or white and red carnations wedding bouquet starting at $70. A grand wedding bouquet will cost around $120 to $150. White and Peach Roses or White and Red Carnations, Hydrangea or Gerberas are great choices. Women prefer pastel colored Roses; whereas men prefer red. It’s better to go for seasonal flowers instead of rare ones, since the latter are more expensive. Brides usually adorn their hair with flowers. Traditionally, flowers are often showered on the couples after the ceremony. The groom’s flower worn on his lapel, usually matches one of the flowers in his bride’s bouquet. If you in a relationship, an anniversary is a day very similar to Valentine’s Day. It’s a day where you can make up for everything you would have missed in the past 12 months. 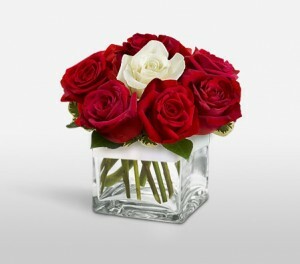 The safest is to send red roses; as they are an all time hit when it comes to love & romance. If you’re sending flowers for your parent’s anniversary, sibling’s anniversary or a friend’s anniversary, a good choice is an arrangement of seasonal flowers accompanied with some chocolate. 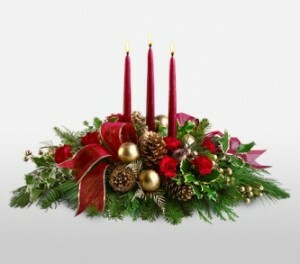 If the recipient’s are likely to host a party, a centerpiece arrangement is a great idea. Price: An anniversary arrangement costs $65 to $75. A hand-tied bouquet in luxurious gift packaging & chocolates will cost around $125 to $150. It’s a good idea to know their favorite colors before you select an arrangement. If they like bright, go for bright Red or Pink flowers. But if they’re more toned down opt for some soothing colors like light Pink, Cream or White. A hand-tied bouquet in luxurious gift packaging makes quite an impression. Traditionally, an arrangement of Daisies are send for a Golden Anniversary (50th anniversary). It is said that Orange Roses are the wild child of the Rose family. Send them to show your passion and a wilder side of yours. Since you are showing sympathy over someone’s loss it’s best to send white flowers like Lilies, Gladioli, White or Cream Roses, White Carnations, White Orchid sand Irises. Price: A tradition funeral wreath or sprays starts from $200 to $250. 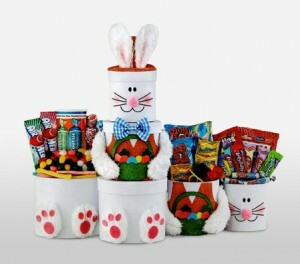 A sympathy bouquet or a sympathy basket will cost $50 upwards. Choose funeral flower arrangements which are traditional hand-made wreaths or Standing Sprays. If possible place your order at least two working days prior to the funeral date. 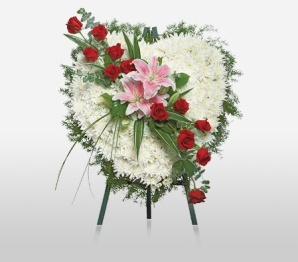 When sending flowers to a funeral parlor remember to send either a funeral wreath or a Casket/Standing Spray. 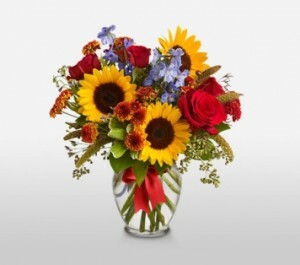 If you are sending flowers to the family members’ homes it’s better to chose a Sympathy Bouquet or a Sympathy Basket. It’s improper etiquette to send a Funeral Wreath or a Casket/Standing Spray to a residence. Please take into consideration the faith and culture of the deceased before sending funeral flowers. The White Stargazer Lily is the most popular choice for funerals. Once the funeral service is over, Potted Flowering Plants are often carried home by the family which lives on as a memory of the deceased. Where Flowers Come From In The USA? Some flowers are grown locally; however 78% of cut flower stems purchased in the USA including Roses come from Colombia and Ecuador. The rest are imported from around the world including Central America, South America, Asia, Europe and even Africa. California is America’s top cut flower producer. You may not know from where they come from, but you can be sure they pass through a lot of caring hands that carefully plant, grow, ship, design and get it delivered to you. Choose Seasonal Flowers: Sending seasonal flowers is a good idea to lower the price of your purchase. Despite their low cost these flowers are fresh and look beautiful. Check The Petals: If you see the petals drooping; darkened near the edges or in some areas than the other; do not buy them. Drooping or withered flowers in a bouquet means, “I have no interest in you”. Don’t Just Make A Purchase Based On Color: Go to the store or a website with an open mind and look at what appeals to you the most. All flowers are beautiful regardless of their color. Roses that are sent every month says “Your beauty is ever new to me”. Any color single Rose (other than Red) says, “Thank you”. A thorn in an arrangement represents danger. With each bouquet there is usually a complimentary flower care guide/tag & a pack of floral preservative. Follow the directions on the back of the packet to help extend the life of your flowers. Flowers are an amazing source of comfort and an expression of love. These naturally beautiful miracles can warm the heart, express our deepest feelings and communicate our mind without us even speaking a word. So why will you not want to gift them to the people that mean the world to you?